I know that these days it’s increasingly unlikely, but if you picked this CD off a shelf, you might well be tempted to do a double-take. Yes, the label does say “Orchestral Concert CDs”, and yes, the CD does contain three violin sonatas. There’s a simple reason for this apparently contradictory state of affairs: since Geoffrey Terry’s entire catalogue consists of just 15 CDs, it would have been fairly pointless to invoke another label (or, arguably, even two) to accommodate just three of those CDs – this one and CD4 which contain chamber music, and CD11 which is a solo piano recital. However, quite apart from their merits in respect of the musical performances they preserve, these non-orchestral CDs offer an interesting sidelight on Terry’s distinctive recording technique. Geoffrey Terry made all his recordings using the same configuration of two microphones (see this article for details). This configuration was conceived specifically for capturing an orchestral sound corresponding, as nearly as possible, to the balance created by the conductor. The results he obtained were astonishingly realistic. However, that identical configuration used for recording chamber music seems to be less successful. On this CD, the first impression is that the piano emerges from the left loudspeaker only and the violin similarly from the right, with a huge “hole in the middle”. But if you listen a bit more closely, it soon becomes clear that the stereo image presented is in fact entirely realistic, provided that you’re sitting right up close and midway between the players – in effect, just where a conductor might have been standing to direct this diminutive orchestra. And indeed, there is in fact no “hole in the middle”: you hear nothing (except ambience) in the middle simply because there’s nobody playing there. Hence, it turns out that the only unrealistic thing about this recording is the placement of the listener’s seat – a conclusion perhaps worthy of an exclamation mark. Of course, if you’re listening via loudspeakers this is no big deal – if the separation of the two players feels too wide you have the option of moving the ’speakers closer together or your listening chair further back. A headphones listener has no option but to get used to his unusually-placed seat. That said, if you’re technically-minded, there is something you can do about it (see Footnote 1). Happily – not that the foregoing makes me actually unhappy – there are no such problems with the content. Plenteous useful background information on the performers can be found in the earlier reviews of this CD by Jonathan Woolf (see Footnote 2) and Stephen Greenbank, so I need add only a few points relating to the domestic Brahms recording. Firstly, it was made in 1973, fully ten years after Campoli and Katin’s partnership formally ended. Secondly, Geoffrey Terry taped the entire proceedings. Thirdly, they rehearsed each movement immediately before “going for a take”. Fourthly and finally, each take is effectively a live performance, presented on the CD exactly as played (as it happens, the short Scherzo’s rehearsal play-through went so well that, without further ado, they elevated it to the status of a formal take). I have listened to these rehearsal sequences. They are remarkable for the players’ relaxed but businesslike approach. It would seem that, such was their continuing mutual understanding, they didn’t feel the need to agonise endlessly over their interpretation, but limited themselves to practical matters – mostly confined to brief exchanges regarding details, in particular a couple of places where Campoli asked Katin to hold a crotchet (or whatever) for a touch longer, as otherwise (as he clearly demonstrated) his violin’s awkward phrase would come out cramped. The Fairfield Halls recital effectively compared – or perhaps contrasted – violin sonatas written by Mozart and Beethoven when they were about the same age (31 years). The Mozart could be described as the more mature work, though not because Mozart was nearer the end of his life than was Beethoven (Mozart was a genius, but I doubt that that made him prescient), but because at that age he’d been “in the job” some seven years longer. Then again, Beethoven, once he’d got started, was apparently a faster developer – so, as the saying goes, you pays your money and you takes your choice! It was a happy coincidence that Campoli and Katin much later got together to play the Brahms sonata (written when he was 55 years old), which nicely rounds out the programme and definitely does encourage a tripartite comparison on a couple of fronts – not that I’m about to embark on any such exercise right now. One thing, though, struck me as mildly remarkable: were it not for the slight difference in ambience and, rather less subtly, the recording details in the booklet, I would never have guessed that the Brahms was recorded such a long time after the other two works. All three performances share exactly the same almost effortless “feel”; it’s not easy to put into words, but something along the lines of “two soloists with highly individual personalities at complete ease with one another – and doing what comes naturally.” And “natural” is probably the operative word: it’s as if the music is pouring out of them ready-formed. 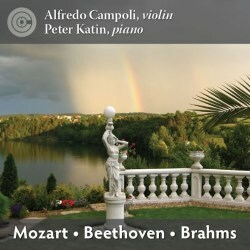 Katin’s precision and incessant dynamic subtlety make a splendid foil for Campoli’s rather freer expressivity, graced by the occasional bit of well-judged portamento and a flexible tone that tracks the mood of the music phrase by phrase – not for nothing, it would appear, was Campoli nicknamed “the bel canto violinist”. Campoli and Katin’s view of Mozart’s K526 is interesting, being a refreshing blend of the elegant and refined with the bright-eyed and bushy-tailed. We’d all agree that the former is pretty well mandatory for Mozart, but isn’t the latter less to be expected, being perhaps more of an optional extra? Either way, it’s a very welcome one, in which the aforementioned pinpoint accuracy of Katin’s fingerwork beautifully complements Campoli’s eloquence with the bow. This makes for very lively accounts of the outer movements in which, I noticed with an appreciative nod, they drew a keen distinction between the first’s allegro molto marking and the finale’s presto, the latter coming across as singularly “unbuttoned”. Their seemingly effortless “give and take”, which is an equally prominent feature of their wistfully glowing central andante, is a constant source of pleasure – a pleasure enhanced, I might add, by the recording, which left every least nuance (and there are plenty of those!) exactly where it belonged – in the sure hands of these consummate craftsmen. Campoli and Katin are every bit as persuasive in the more blood-stirring dramatics of Beethoven’s Op. 30 No. 2. Their first movement is a veritable roller-coaster ride, both emotionally and dynamically. They negotiate the procession of crescendi, emphatic chords and stormy climaxes with impressive fluency, pointing up yet integrating the almost prissy posturings of the strutting second subject and the moments of uneasy repose into the almost juggernautical (is there such a word?) thrust of the argument – and their final climax is a real “belter”. The Adagio Cantabile goes, quite literally, like a dream; its long (about 45 seconds long) melody could almost have been specially written for Campoli or, for that matter, Katin, so seductively do the two of them weave the variations. Adopting an apposite andante tempo, they take the allegro marking of Beethoven’s delightful little Scherzo at face value, for “cheerful” is exactly how it sounds – you can imagine them smiling at one another as they peck out Beethoven’s teasing little syncopations. In all but syncopations, the Allegro finale feels like the Scherzo “in long trousers”. Campoli and Katin plunge into it with a great deal of healthy vigour, taking full advantage of every contrastful stress to urge the musical momentum (including some jolly, bouncy “oom-pah” rhythms). Following the hiatus, held just long enough, their coda sets off at a fine old gallop; far from unbalancing their horse, a few gentle tugs on the reins are artfully deployed to further enliven the final charge. Having heard their Mozart and Beethoven, you may feel that you know what’s coming when they tackle the Brahms Op. 108, which in some superficial respects seems to be modelled on the Beethoven Op. 30 No. 2. If so, then you won’t be disappointed! Campoli and Katin give the music its full Romantic measure, endowing the louder passages with a thoroughbred Brahmsian heft, paced and phrased to avoid even the slightest trace of “stodginess”, and, at the other extreme, articulating the music with (to me, at least) sublime sensitivity. In the first movement Katin renders Brahms’s brief bursts of three-against-two cross-rhythm as neat as ninepence. Leading in the second subject, he momentarily gave me the distinct impression that Brahms was anticipating Rachmaninov (which, generally speaking, is not a connection that readily springs to mind), whilst Campoli, taking up this melody, squeezes out every last drop of its increasingly passionate intensity. I must say that that expansive “a-daggio” did not strike me as one whit too slow, although it’s fair to add that this is only the basic tempo; in the more agitated variations the players make exceedingly good use of the resulting elbow room. This is a heartfelt performance of great beauty and poise, well worth 5 minutes and 29 seconds of anyone’s time. In the little Scherzo (even littler than the Beethoven one), they hit the un poco presto e con sentimento right on the button, fairly tinkling through the filigree and cutting loose (but not too loose) with playful zest in Brahms’s more ebullient episodes, most notably thumping out the alternating piano/violin chords with palpable glee. They launch the finale with a startling bang, giving the presto piles of aggressive, almost motoric agitato, and paring the sound right down for the curiously coiling second subject. It’s worthy of remark that, in the Mozart and Beethoven, the members of the audience were so enthralled that they (well, most of them) forgot to cough – which is even more remarkable when you remember just how much noise audiences used to make in those days (as anyone who has heard the BBC Legends recording of Barbirolli’s “swansong” performance of Elgar’s First Symphony can testify – the start of Elgar’s finale was completely swamped by continuing torrents of exhibitionistic expectoration). Needless to say, the audience in the later, domestic Brahms recording is as quiet as a Church mouse. Ambiences, especially the latter, are quite close, but by no means distractingly so – the instrumental sounds have a very agreeable warmth and immediacy. Featuring photographs of the two performers (a particularly nice one of Campoli), the booklet says nothing about the music, instead presenting short essays on the performers by Geoffrey Terry. All in all, I found this a fabulous disc. You can regard it as an important historical document – which I suppose it is – but really that’s just for starters. It’s also a valuable record of an exceptional partnership at the top of its form (twice!) and a trio of absorbing and entertaining performances. I wouldn’t dare go so far as to claim any sort of “reference” status but, whatever your favourites may be, this set would sit very nicely alongside them – and, yes, maybe even pinch first place in your affections. 1. As I mentioned in my article, it’s possible that, if Geoffrey had been of an experimental frame of mind (which he admits he wasn’t – he just wanted to prove his theory), it’s odds-on that he would have found that moving his microphones closer together would have progressively reduced the separation of the players in the sound-image. I’d guess that there will be a relationship between the spacing of the two microphones and the lateral extent of the ensemble. As a crude check, I tried using an audio editor to introduce some crosstalk between the channels: this did indeed simulate the anticipated effect. Of course, to do it properly, to preserve the “natural” sound-field, the phase differences would need reducing proportionally, but sadly that’s a far less practicable proposition. However, even with just a bit of added crosstalk, some (headphone) listeners might well find their vantage point feeling much more comfortable. 2. In his review Jonathan Woolf may, I am sure inadvertently, have given some readers the impression that only the later Brahms item was recorded by Geoffrey Terry; I’d just like to confirm that all three items are in fact Terry recordings.